When it came to choosing our wedding bands, it took us some time to figure out what we wanted. Our original plan was to make white gold wedding bands together at a workshop in Toronto. We signed up, paid the fee, went to a jewellery store to get sized and…it just didn’t feel right. We weren’t ‘gold’ people (except for our hearts of gold of course). So we cancelled the workshop and regrouped. A bit more research led us to Touch Wood , a small off-the-grid operation on the West coast run by a sweet couple specializing in wooden wedding bands. After starting correspondence with them, it occurred to us that my dad might have the tools to help us make our own. So we canned the B.C. idea (notice a trend? Don’t worry, we are more decisive about our love for each other) and commissioned my father to create a prototype. He had many varieties of wood on hand, mostly salvaged from his arborist friend and his own backyard. So we chose a few pieces that looked interesting and he generously offered his time and materials to make the ring blanks for us. 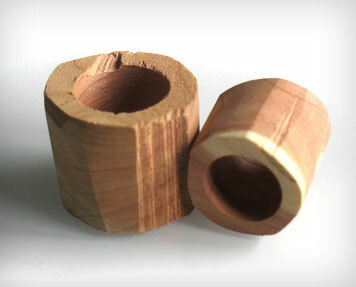 I took these and sanded them down to the shape and thickness that we desired. A bit of beeswax and walnut oil provided a silky-smooth finish. I had so much fun doing it, that I just kept asking for more samples. I have since started experimenting with different types of wood and new design ideas. Perhaps you are asking yourself, “is a wooden ring durable?” Or, “what if the rings fall apart…will their marriage follow?” These are valid concerns that we also considered. 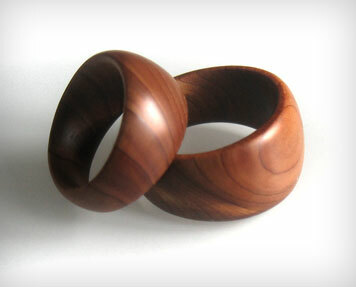 A very satisfied Touch Wood customer expressed it perfectly when she said that wooden wedding bands are an excellent metaphor for a lifelong relationship. They are strong, but not indestructible. They need to be treated with love and care in order to last. We loved this way of looking at it. We also considered that our relationship will be quite different in five or ten years, and it would be lovely to celebrate this evolution with a new ring. A chance to renew our commitment to each other. Plus, who doesn’t like an excuse to get new jewellery? Tara, even though I’ve seen the progression of these rings first hand, I’m still amazed that you created these beautiful pieces! I love them! Those are really cool – and beautiful too! Very original, guys. Way to go guys, now I have to make one for Mary. She loves the idea. Well, gotta go out to our forest and find the right wood. The bush is beckoning. I might hunt some wild turkey while I am at it. Thanks Uncle Rich…I’m sure Tara will give you some tips! Would you mind dropping me a line with the deets on your finishing process? The beeswax and walnut oil business? I am handcrafting our wedding favours and am looking for the right finish. Wouldja? Couldja? Our wedding is in 10 days so we are in scramble mode…. much much appreciated! Dear Aaron and Tara: Can you guess that I have the day off today? So I ‘m sending all my comments in today. The rings are beautiful…hats off to you Tara…what a talent. Now, Aaron, make sure you take the ring off when you wash the dishes. Love A.D. Here's the plan so far. We'll let you know if anything changes. Hey, I want a Wedding Website too! Or a regular website for that matter. Okay, head on over to Blind Pig Design, have a look around and drop me a line if you like. We'll talk. Many thanks to Gifford Cheung and Brian Watanabe for the RSVP plugin and Andrew Ferguson for the countdown timer plugin. And thank you Tara, for inspiring me.